If this is your first introduction to Asia, Singapore is your top bet. Top architecture, vibrant ethnicities and innovative restaurants, art scene to dazzle you and food to delight your palate. We've visited Singapore off and on since the 1960's, usually working. 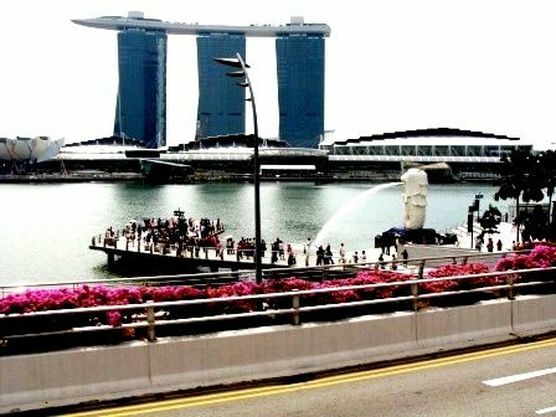 The National Beast is the Merlion but it should be the Chameleon because every time we see this city state it has changed its colours and shapes and sizes and self-confidence levels. As we are currently working in Southeast Asia not far from Singapore, we decided to have a break there. Besides, we wanted to download new books to our Kindle and we were sure that Singapore would enable us to do that directly through Whispernet which hasn't yet at that time quite reached our little backwater. ​So, off we went to Singapore and this time for a break and a scrounging around of old memories. In the past, we were usually working and had tight scheds. We never bothered to do the full Monty other than for the requisite dinners as we thought there was really nothing interesting. This time, our plan was to see the sites, talk to locals, check out changes and try to understand how a country can behave as a Company! Anyway, we used to stay in the vicinity of Orchard Road as that was convenient for work. So, for a change, we booked in along Marina Bay so we could walk the old town and check the balance of Imperial left overs and I.M. Pei architectural triumphs. Since we were on the Marina Square across from Suntec, the convention center, we just walked around there first. Parked there were the hop on, hop off buses, two deckers with no roof so we decided why not? 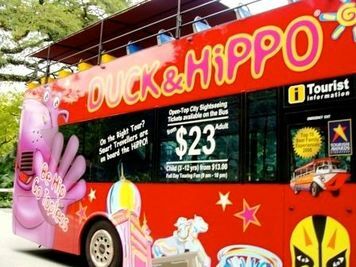 We soldiered over to the Hippo Tour bus whose driver was not only friendly but run us through all the deals we are going to get. Thank goodness he wasn't selling rugs! Not one to give up great bargains, we took the full day package and planned to go first on the city tour and then take the heritage tour. This Hop on Hop off system is wonderful. For years, we scorned this kind of thing as the last bastion of the blue hairs and German/Japanese Tour Squadrons, but being blue hairs ourselves now, we know it is the fastest way to get a quick overview of what a city has on offer. So, now, we usually take 'the tour" on our first day in any city we visit. We get to see the sights and decide which ones would be worth a return visit. There are guides in these buses giving us a background of the history of the place and other interesting vignettes. Some are flaky pastries pumping their own tips, but many are worthwhile. So, off we went to our city tour. We stayed on top of the bus to see better and take some pictures. Half of the bus is roofed with canvas to protect you from the sun but not deprive you of the view to be had and the sense of being outdoors. Our first stop was the botanical gardens which we always love to visit each time we come to this city. It is an oasis very close to Orchard Road, one of the busiest commercial districts in Singapore. The orchids alone are worth the visit but the flowers have attracted birds and butterflies and it is a wonderland. We stretched our legs and enjoyed nature and the rain forests. The other good stop is the riverside where you can take a boat trip. We put this off for the next day. Memories of the Brit Navy and the rather scummy reputation Singapore enjoyed before the War were best left to another day. We enjoyed the cruise. It gives you a different view of the city and you can look back to snippets of history. Singapore has interesting ethnic neighbourhoods. Little India is a favourite. One is immediately transported into the subcontinent by the smell. The Straits Chinese also have an area lined with Peranakan houses in Soon Keng Road and East Road. One of my favourites to see is the trapezoidal 37 story Gateway Twin Tower designed by I.M. Pei. As you circle around it, you see a different image from each direction. I.M. 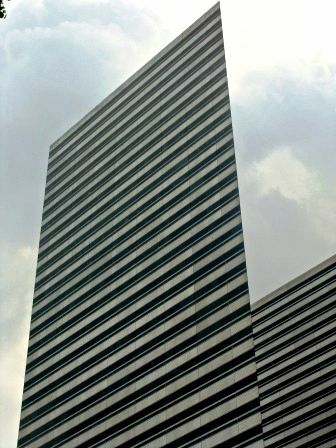 Pei has two other buildings in Singapore: The Raffles City and the Oversea-Chines Banking Corporation Centre. The Marina Bay Sands designed by Moshe Safdie is also a stunner. The Cooled Conservatories at Gardens by the Bay is a great attempt at making urban places livable. The Helix Bridge and the Esplanade Theaters on the Bay should been on this list, too. Some of the well preserved Malay architecture are also interesting as well as the old Peranakan houses. The Chinese temples are also worth a photograph. Our next stop was Orchard Road where we enjoyed a bit of shopping. We visited a few stores. CK Tang, the first of the great megastores here and, of course, Lucky Plaza where despite the national howls of moral rectitude, even the fakes are fake. It is the last of the great scungy multi floor oriental bazaars and it is worth every second you spend and every SDollar you waste. It was refreshingly clean and efficient. Of course, next door is the high end Louis Vuitton, Dior, Prada, Coach, Bulgari, Ferragamo, Chanel et al and be assured that what you are buying is authentic. We needed to retreat for R and R to our hotel from the shops so we just hopped on the bus again. After depositing our packages, we took the heritage tour. We did not leave the bus this time. Instead, we allowed the bus to take us around so we didn't miss the commentaries of the tour guides on the specialized ethnic areas. Singapore came within an inch of consuming its own history and just in time it saw that it would lose its soul and also any hope of tourism. So there are still some greatly upgraded landmarks in the city and the little pockets of minority areas like Little India, Thieves Market, China Town and the Malay heritage center. This is a reminder that the City has a multi ethnic history that is really worth studying as it seems to work well. The first mosque, Saint Andrews Cathedral, the first Hindu temple, the port area where the Chinese first settled and Bugis, the electronics area all are in good nick. The next day, we wanted to check out Sentosa Island as we had avoided this manufactured tourist magnet place in the past. This time, we wanted to do the tourism bit so we took a cab to Mount Faber and then cable car. It is the highest I have ever been on and because they have recently renovated it, it looks sparklingly new and inspiring confidence. The views are fantastic as you can get an aerial peek of the water front. We saw how busy the port area is, demonstrating how well the Singapore economy is doing. Yes, there are lots of jobs here. And wealth, too. Make no mistake, this is a very wealthy country and it is run in a very efficient manner to create this wealth. Sentosa is the biggest park in Southeast Asia and lots of fun activities are there for tourists to enjoy. We went for walks and enjoyed the butterfly garden as the rides are really not for us but we could see the fun all the younger ones are having. More shopping was done the next day. This time, we went to Bugis for electronics. Yes, we got a lap top and a camera for really good prices. You can get the sales tax back at the airport when you spend more than a hundred Singapore dollars in a store. Unlike other countries, this process is very efficient here so it is worth going through it. For food, there is always Marks and Spencer for some of those super Pom cookies you miss and other specialty stores for the things you can't get back in Limbo. That evening, we were meeting some family members who are younger so we thought, we would first have a Singapore Sling in the iconic Long bar in Raffles. We stayed in the hotel when it was still the old dame with the glorious foisty smells of Imperial Hotels. Conrad slept in that room, Greene over there. It's all rebuilt now but the occasional Pith Helmet display give a hint of history. From there, we took the younger ones to the Hard Rock Cafe where we knew they would have a blast. We had another drink in the bar as we had no reservation so had to wait as the place is very busy. It is wise when you plan to go there, to make a reservation. It was a fun place with the whole restaurant greeting birthday celebrants as they each went to the stage and blew the candles and burnt out rockers raging at destiny on the silver screen. Singapore is fast becoming a destination for those who love to go out at night and enjoy wholesome fun. Singapore has positioned itself not only as a financial and business hub in Asia but also as the place to hold international events. You must have heard of a number of events Singapore recently hosted. And when we were there, we went to a fabulous modern art exhibition which just floored us. But the Singapore Sun Festival tops all the other sun festivals in other major cities. Celebrating the Art of Living Well, this festival attracted acclaimed musicians like David Foster, Natalie Cole and tenor Jose Carreras; actors, chefs and other artists who joined in the extravaganza of music, literature, visual arts, film, wine, food and wellness. No other state has achieved what Singapore has done to transform its tiny country. Maybe, it is easier given its size but it is more than that. It rallied its people to make it happen and that is all because of the leadership of its Minister Mentor, Lee Kuan Yew. Today, Singapore is Asia's shipping hub with over 600 shipping lines with their super tankers, cargo ships and passenger lines crowding the city's port. The port facilities are just amazing as well as the logistics to handle the traffic that you can so easily see when you tour the city. With this world class port, Singapore has become the major ship builder and repairer as well as the top refiner and distributor of oil in Asia. Singapore is also the electronics components hub and where Asians flock to buy any electronics gadget in vogue. Now, many apps companies and startups have made Singapore its home attracting skilled Indians and Filipinos to work at many of these computer applications. Yes, if you have advanced skills in computer, try posting your resume in Monster Inc. and jobs will be flying your direction. But Singapore's goal is to take from Hong Kong the crown of being Asia's financial centre. Maybe, Asia is too small, it will take on the world. And with its over 300 banks, it will become that soon. Or, has it already become this? This city tour gives you a picture of a green city. Yes, Singapore has trees everywhere as it boasts and puffs of its Green commitments, and these hard wood trees give it freshness and stability as well complimenting an array of world class architecture which is scintillating. The green space compliments the bustle of a commercial. The city is light and not overwhelming and it really is a model for others to check out. No Country could be quite as great as the image Singapore reflects. Pride slides to hubris every once in a while as " biggest this" or "greatest that" gets a bit tiresome when it's in your face all the time. ​Still, history is now treating Singapore well and it is well deserved. It has come a long way since King Rat and the depths of the 1940's and should celebrate what it is. You will really enjoy joining in with that celebration.